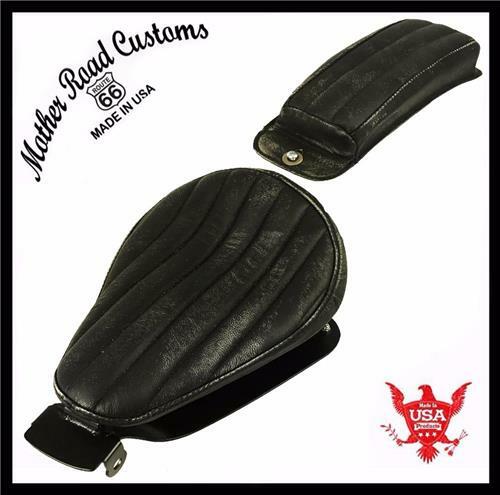 2010-2018 Black Distressed Tuck and Roll Leather Spring Solo Seat P-Pad and Mounting Hardware Kit. Our Seats and kit are made in the USA with 1/8" US Made cold rolled STEEL. The seat pan is made of 1/8" inch thick steel. This makes it a very rigid and strong seat pan, that will be able to take a lot of abuse. The seat measures 9" wide by 12" long. The studs in the rear are spaced 7" apart. Custom sizes are available. The seat has a dense 1" layer of closed cell foam. The P-Pad 15 x 5 1/2 " with 2" of foam and is designed to bolt right on your fender using the front fender mounting bolt and the rear fender screw on the fender. The 2010-2018 Sportster, seat mounting hardware is included.? You can call 314-972-4305 for questions, or to make a purchase over the phone.